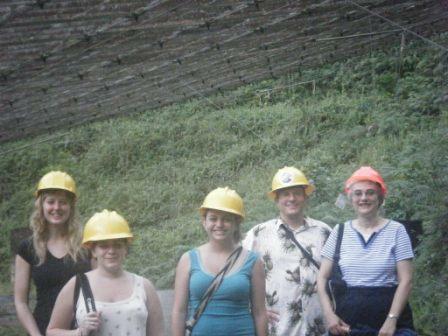 Enjoy this report from Catherine Weigel (Hartwick College), a member of the ALFALFA Undergraduate Team, on a summer observing trip to Arecibo Observatory. 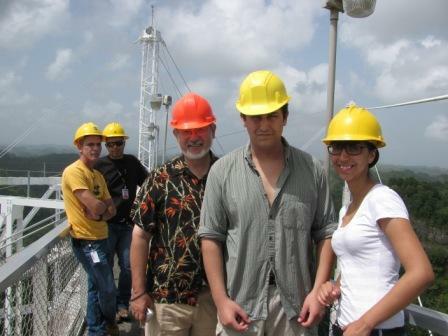 The week of August 17th, 2010 brought together three undergraduate ALFALFA teams at Arecibo Observatory to learn what it is like to observe and do Level One Data Reduction. Hartwick College of Oneonta, New York and Union College of Schenectady, New York arrived on the 17th and proceeded to jump right into an observer’s schedule by collecting data that very night. This was a very tiring night for all of us, and as the night progressed, the conversation dwindled, turning into concentration of observing and staying awake. We were joined by St. Mary’s College of Moraga, California on the afternoon of the 18th. The teams became more acquainted during the evenings when flagbb sessions, HI contouring tutorials, CIMA simulations, and project discussions commenced. Each team taught the others in some fashion, sharing notes and tips on data analysis and the galaxy groups collaborative project. All the teams quickly bonded with each other through these nightly sessions and much laughter was shared throughout those early observing hours, as the tea kettle whistled and the coffee brewed. 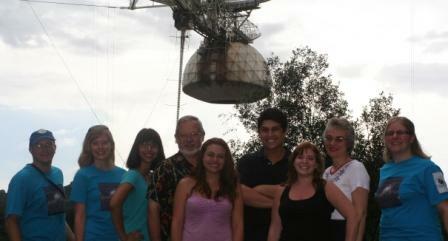 Hanging out on the telescope platform, far above the dish. 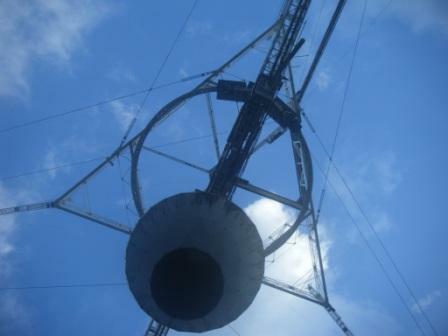 Throughout the week, between sleeping, flagging, and observing we were able to take a tour of the facilities and try to grasp the size of the radio telescope. Upon first seeing it, (as this was my first time in doing so) the telescope is much larger than pictures can convey. And with each new view, from the visitor’s center, the cable car, walking around the dish and under the dish, the telescope’s scale is amazing to take in. Being able to go up on the platform and into the dome gives the true scale of it all; but once back on the ground it is still hard to believe. Another cool thing about the platform tour was going into the dome (it was really warm in there!) and being able to see ALFA, giving some tangibility to the science and the name. Going under the dish was also pretty amazing. Under the dish has its own environment with multitudes of greenery and tiny toads hopping around all over the place. The view of the platform and dome is also pretty neat– looking at all that geometry is just downright cool. Looking up at the platform and Gregorian dome. 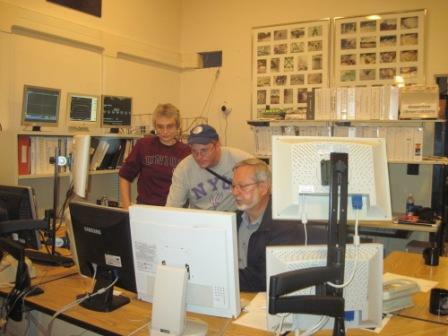 Each Group spent a night with control over the telescope and the observing process. Before taking control and running the show, the CIMA simulation was conducted many a time and a copy of the observer’s checklist was firmly in hand. The first nights of observing the professors were in control of starting up, watching and logging, and closing shop with students keeping a watchful eye on the proceedings. Then came the night Union students were in charge, then St. Mary’s (with Hartwick doing ending procedures) and the last observing night Hartwick (with St. Mary’s ending the night). The experience to control and run the world’s largest telescope was very awesome with a side helping of nervousness, making sure that everything went smoothly (which was achieved!) While observing, we learned how to identify GPS and not to worry when the orange extrapolating-point-data error occurs as it occurs regularly (though it is scary when it comes up and never having seen it before, thinking it is a real error). The advantage of having the orange error come up was becoming familiar with the observer’s checklist instructions on WAPP errors (these of course being in red). Though fortunately not used, that part of the checklist was looked over and was the page that was left open by the keyboard. Enjoying the green world below the dish. Overall, everything went very smoothly and we now know how to flag and how to take data with Arecibo. It was a wonderful experience to be able to go down there and to be able to see where all the data comes from and to make the connection with other ALFALFA teams. It was also a good way to more fully understand all the work that goes into level one data reduction and really all the work that has gone into this project. Great job! More pictures below the fold!